Actor Benedict Cumberbatch is currently making the rounds to talk about “Star Trek Into Darkness,” and has mentioned working with Meryl Streep on the upcoming “August: Osage County” in an interview with New York Magazine. The complete interview can be read here with his quote being snipped out below. Misery loves family! The Weinstein Company has released a first poster for “August: Osage County” today via Yahoo Movies, giving a first glance at the November releasing family drama starring Meryl Streep, Julia Roberts, Benedict Cumberbatch, Ewan McGregor, Juliette Lewis, Margo Martindale, Julianne Nicholson, Abigail Breslin and Sam Shepard. When the family patriarch vanishes, the Westons return to rural Oklahoma to care for their afflicted, manipulative mother Violet. Armed with prescription drugs and paranoid mood swings, Violet reigns over the home as family secrets unfold. According to GoldDerby, John Wells’ screen version of “August: Osage County” just had its first test screening and reaction was overwhelmingly positive. “Our forum posters have been busy parsing the tweets of those in attendance. Almost all agree Streep is the one to beat for Best Actress at the Oscars”. The Broadway run of the play reaped wins for Deanna Dunagan as the vile Violet and Rondi Reed as her long-suffering sister Mattie. Margo Martindale (“Justified”) now plays that part and those who saw the film say she is likely to reap a supporting Oscar nod. The complete article with more information and reactions can be read here. In a recent interview, actress Margo Martindale has dished on the recent filming of “August: Osage County”: August was a wonderful, incredible two months. It will look beautiful. The script is magnificent. The actors are all fabulous. Will it all work? That will be a mystery. I was wildly happy to get that part, and I said to myself, after seeing it on Broadway, “I want to play that in the movie.” Rondi Reed, who played it on stage, I couldn’t have perfected that. There was no need to do it on stage. So I decided to set my sights on the movie. 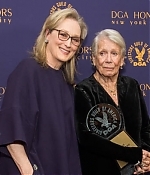 You’ve worked with Meryl Streep, who plays your sister Violet, a few times in your career. Did that previous experience with her help build your relationship as sisters? Tremendously. We spent our off time together. She’s a great, great person. These sisters really lean on each other, and I’ve known Chris Cooper, who plays my husband, since 1981. I love him so much. I think that when everyone got this job, you had that looming around in the back of your mind. Juliette Lewis said, “So much came with getting these roles,” and I responded, “I know. I wish we had never had that. I wish we had just been out here doing a movie.” Which we were, but there was so much expectation. There’s something about that that makes it hard.” The complete article can be read here. Indian Country has recently interviewed actress and Blackfeet native Misty Upham. The darkly comedic play August: Osage County premiered at the Steppenwolf Theatre in 2007. It went on to Broadway, where it had 648 performances and won the 2008 Pulitzer Prize for Drama. Since then it’s toured across the U.S. and around the world. One of the play’s key roles is Johnna Monevata, a Cheyenne woman whom the Weston family hires as a live-in housekeeper. Johnna is the witness as the sharp-tongued matriarch lashes out at family members, in-laws and hangers-on. It’s scheduled to be released in 2013. What was it like working with stars such as Streep, Roberts and McGregor? Nothing less than amazing! It was strange to be running lines with Ewan. I remember thinking, “I am running lines with Obi-wan!” Surreal. But once you get past being starstruck and see how they approach work then it becomes less scary. They’re actors like myself. And wonderful people. I took any chance I could to watch Meryl live. When she worked, everyone watched with awe. Even the props department. It was inspiring to see such respect for a true icon of our age. Amazing. Did you have any funny or nice moments with your co-stars? Tons. Watched news coverage of Hurricane Sandy with everyone at Meryl’s one night. She was pointing out her apartment on the screen. Ewan would sing to amuse us in the morning while we got our hair and make-up done. That was pretty sweet. And trying to talk George Clooney into trying the amazing crabcakes at Sterlings was fun. He wouldn’t budge. New article about Tracy Letts’ adaptation of “August: Osage County” for the big screen courtesy The Los Angeles Times: Letts’ play tells of several generations of the colorful Weston family, particularly drug-addled matriarch Violet (Streep) and troubled professor daughter Barbara (Roberts), as they gather in the family home for a few weeks one summer, each personality trying to get the better of the other as they cope with their complicated lives. “I think it’s very recognizably the same piece,” he said. “There’s not a lot of invention per se. There are opportunities to let them loose from the house, and I did some cutting to try to find those places in a play that sound maybe a little theatrical to the ear if you were doing them on screen. But that’s about it.” Several months ago, as he was preparing for that show, Letts traveled to the Oklahoma set of “August” to join actors at a table read and field questions. Roberts, Streep and others peppered him with the meaning of the text. (He said their questions were “workmanlike” queries about their characters and his intentions, “things an outsider might find banal but that are important to an actor.”) The complete article can be read here. 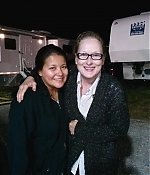 Here’s the very first look at Meryl Streep in character on the set of “August: Osage County”. Pictured with her is Margo Martindale, who’s playing her sister, Mattie Fay. The film has started shooting this week and includes an all-star cast, featuring Julia Roberts, Sam Shepard, Chris Cooper, Juliette Lewis, Benedict Cumberbatch, Abigail Breslin and Ewan McGregor. When the family patriarch vanishes, the Westons return to rural Oklahoma to care for their afflicted, manipulative mother (Streep), who’s armed with prescription drugs and paranoid mood swings. Many thanks to Joan for the picture.